It is a multifuel stove capable of burning a variety of biomass like firewood,coconut shells, cowdung cakes, twigs and briquetted agricultural residue. Reduced emissions (CO - less than 20 PPM at the operator level and Suspended Particulate Matter in the range of 1.0- 1.5 mg/m3). A power input of 3.5 kW. Versatility -The stove can be used with vessels of all sizes and shapes and is suitable for cooking all types of common dishes. The Swosthee stove is ideal for a family size of 5-6 members. The Swosthee stove is especially suited for houses having roofs made of reinforced concrete,asbestos or other sheets and thatch. 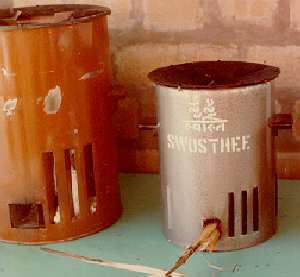 The Swosthee stove has a high acceptability among households living in urban slums where the size of the house is small. and emission of hazardous emissions. The nozzle stove (Figure 8), for example, uses a section of a cone just above the fuelbed to establish zones in which gases from the edge of the diffusion flame can recirculate until they diffuse to the center of the flame and burn completely. 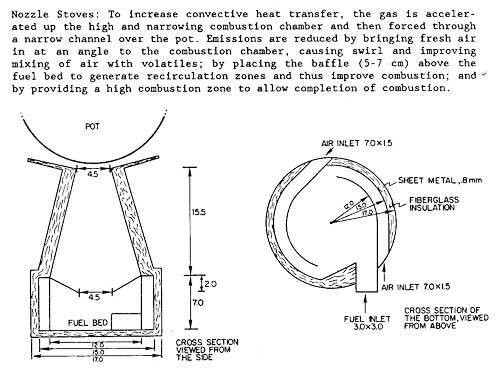 Additionally, this prototype nozzle stove injects primary air at an angle to the combustion chamber to promote swirl and thus improve fuel-air mixing(18, 19).